Hull City have signed Bolton striker Ricardo Vaz Te on loan for a month to help aid their fight against relegation from the Championship. 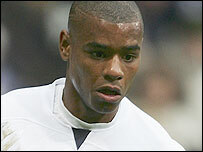 Tigers boss Phil Brown used to be assistant manager at Bolton and is familiar with the qualities of Vaz Te. The pacy 20-year-old is a Portugal Under-21 international and will go straight into the Hull squad for Saturday's home clash with Preston. Lisbon-born Vaz Te joined Bolton from Farense in August 2003.